then talk by the fence. One walks to the stone to my left. "Monaghan;" she says, "so, where is Armagh?" 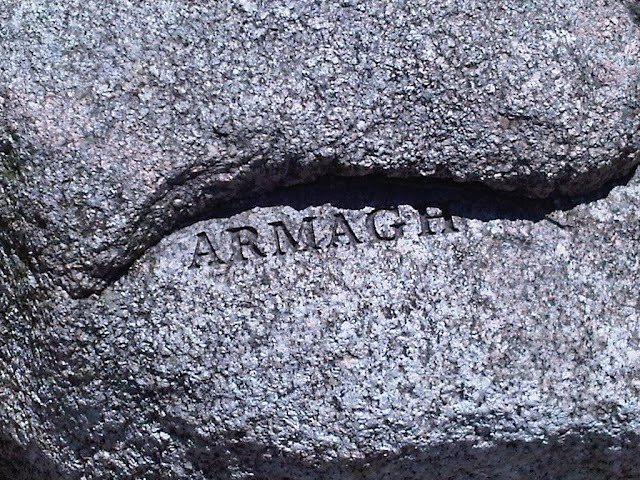 "Here is Armagh!" I say, and stand. Some seashore music: Lou Reed, Bruce Springsteen, and the Tams. Lest you think that Eliot Wagner and I only like music that critics hate, here are a couple of songs from Eliot's podcasts by critically acclaimed artists (in one instance, not by the same as on the podcast), both of which refer--appropriately for this time of year--to places by the sea. I'd forgotten what a great song "Coney Island Baby" is. Clip courtesy of Passthrufire. The song was first released on Lou's album of the same name. One of Eliot's podcasts includes The Band's version of Bruce Springsteen's "Atlantic City". There's no live video of The Band doing it, but you can get the audio and a still of the album cover for Jericho here. The clip above, courtesy of dylanboby, is of The Boss doing the song in Paris, in 1985. "Atlantic City" was originally released on Nebraska. The Tams are probably the quintessential Carolina beach music group. The clip above, courtesy of Low Country Today, catches them, with original member Charles Pope, at The Point, Charleston, South Carolina, in 2008.